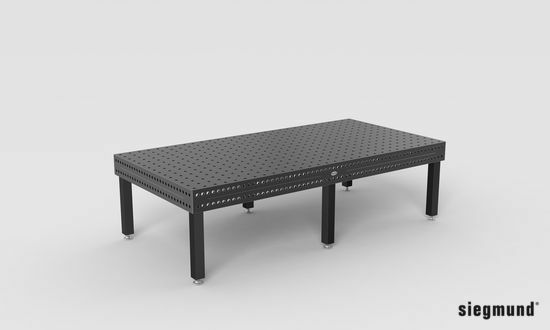 Professional Extreme Table, 3000x1500x200 mm, horizontal / vertical hole arrangement in a 100 mm grid on the table top and a parallel hole pattern in a 50 mm grid on the sides. The diameter of the bore holes is 28 mm, the material thickness is approx. 24,5-27 mm. The primary wear surface on the table’s top face is made of through-hardened tool steel. The four side faces are still constructed from our standard, high quality S355J2+N Steel to provide the ideal balance of properties for performance, durability, and cost. Grid lines spaced 100 mm apart simplify the set-up of your equipment. The welding tables are equipped with scaling as standard.